In our shop you will find over 700 Bowden cable spare parts, with which you can easily carry out repairs yourself or even create new Bowden cables. Our product diversity also proves to be helpful for designers and product designers – especially in the prototyping and testing phase. We are constantly expanding our product, so it is worth checking in with us again and again. Need to fix a Bowden cable? Now you're on the move! If you have questions about specific articles or need help with the selection, just call us at 07423/87 52 573: Our experienced technicians will be happy to advise you. Take this opportunity and order all the Bowden cable spare parts you need for your repair in one shot! Our new online shop! Here you can now find all our current products at current prices. Simply click on the entrance door and you will find a wide variety of parts for your Bowden cable. 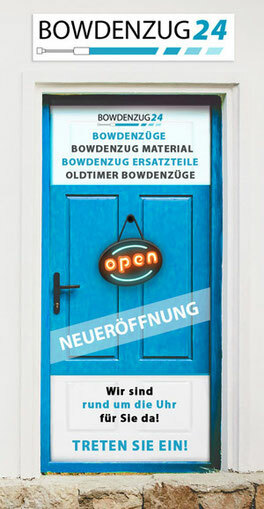 We ask all of our customers to use this new shop at Bowdenzug24.com now. New items will only be posted in this shop. Also in our new shop all our articles are sorted according to the previous categories and groups, so that you can easily and quickly find the right parts for your application. The new shop offers you much more service, so it is equipped for example with a search function which allows you to search for part numbers or search terms.